This week, the founders of the Southland Ensemble – Eric KM Clark, James Klopfleisch, and Christine Tavolacci – will lead SASSAS’ Kids Play Oliveros workshops. On Sunday, September 7, they will lead students from The Harmony Project in a free concert of Oliveros’ music at 2pm at CFAER. The Southland Ensemble will also perform works by Pauline Oliveros at Human Resources on Sept. 9, 8pm. What led you to the work you’re making now? The majority of us in the ensemble had been making music together for over a decade. We all met via CalArts, participated in Michael Pisaro’s Experimental Music Workshop course, and eventually performed together under the Dog Star Orchestra concert series, which is now in its tenth year. Eventually, in 2013, we decided to form a core group and put on events on a more regular basis. Why do you think it is important to expose young musicians early to composers of experimental music? Eric: I just look back to my musical upbringing, which was all classical all the time, and how I would have benefited from an earlier knowledge of experimental and new music. I remember taking private theory and analysis classes at age 16, and the crazy new music I was exposed to was the Berg Violin Concerto. And this was in 1997. Very useful classes, I definitely benefitted from them and don’t want to take away from that; yet I only really delved into experimental music when I went to University. It doesn’t need to happen that late, especially now with the availability of the internet. Knowledge is always important, and so just offering the opportunity for younger musicians to get to know different forms of music helps their individual creative process and interpretation. It opens doors into the many possibilities that exist within what music really can be, and that’s pretty important. Christine: I was fortunate to have a high school theory teacher introduce me to Steve Reich’s early tape pieces. The discovery of these works, of a new (to me) way of listening and thinking about music, quite literally changed the course of my musical life. I remember checking out every recording by the early minimalists and Cage that I could find out of the music library, and shortly thereafter I decided that I wanted to primarily pursue the study of contemporary music. I think it is so important to give other young musicians the same opportunity to expand their definition of music, and to instill a sense of exploratory listening that is often lacking in traditional musical training. You never know how it will factor into their lives further down the road. James: I think it is essential to engage children in the type of creative thinking that is also self reflective. Most music (while still being very creative) leaves little room for creative reflection when you are first learning it – you need to master the most basic motions to play an instrument, and that takes years. You are never asked the question”what is music,” or asked to think about why you react more positively to one type of sound than another. This is not the fault of other music – there is simply no time for it. Experimental music teaches children to ask questions, to open their ears and suspend their prejudices, as opposed to adopting the prejudices of their training. 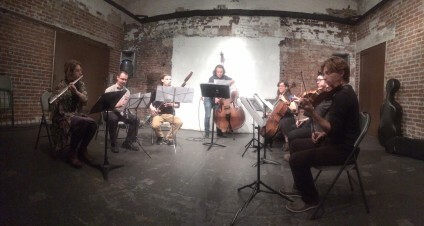 Experimental music is focused on two things other music often lacks – objective listening, and being a self-critical listener. I think that for children this is as much a skill that has to be developed as intonation, rhythm, or sight reading. How did you first come across Pauline Oliveros’ music? Eric: I don’t have a specific memory, though she undoubtedly came up in my classes at CalArts. This workshop and then our Southland performance on September 9th will be my first time dedicating so much rehearsal time to Oliveros’ music, and it’s been wonderful. So the process we’ve been going through in looking through her writings, any online materials and then meeting and planning how to interpret the pieces has been a real pleasure. Like getting to know someone that you know you’ll just click with in a positive way. Christine: I encountered Pauline’s works while studying at CalArts – not in a class but through word of mouth. The first time I performed any of her music was much later, with Dog Star Orchestra in 2011. Eric: I actually don’t listen to much music, but have been listening to a few things. So there’s Jose Gurria Cardenas, Daniel Rosenboom’s Fire Eater, and then a mix that a friend, local artist Eron Rauch, gave to me. It has a bunch of electronic music on it: Darkside, Sarantis, Nosaj Thing, Forest Swords, Burial, oOoOO and then 20 or so more. The Knife (Full Of Fire) is the one I’m most familiar with on this mix, as I was really into their music a few years ago. So some electronic music for now. James: I have a lot of work playing in a band that plays all types of American folk music, so most of my listening is also playing, and most of that is either bluegrass, swing, chicago-style blues, or anything in between. Actually, most of my listening away from concerts is news shows on NPR. We are planning several concerts for our upcoming 2014/15 season – portrait concerts of Pauline Oliveros, James Tenney, and Cornelius Cardew, as well as a Fluxus circus and a concert featuring early American experimentalists Charles Ives and Henry Cowell among others. We chose this clip …. because Bill Roper is amazing, it is in a beautiful setting with lots of intriguing instruments, and it looks like it was a really fun event. Categorized: 5.5 Questions. Tagged: Kids Play, Kids Play Oliveros, Southland Ensemble.